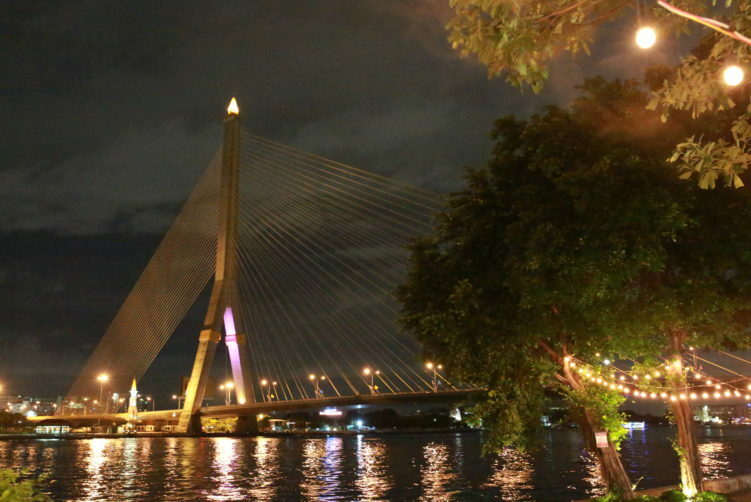 The best thing to be said about Khin Lom Chom Sa Phan, situated on the Chao Phrayo riverside, is the view towards Rama VIII bridge late in the evening. It comes with a nice breeze to cool you off in the evenings. The food on the other hand is a rather different story. 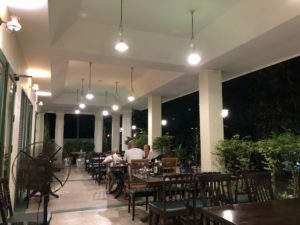 Khin Lom Chom Sa Phan describes themselves as the “Best Restaurant on the Chao Phraya River.” At best, that’s just a bad joke. 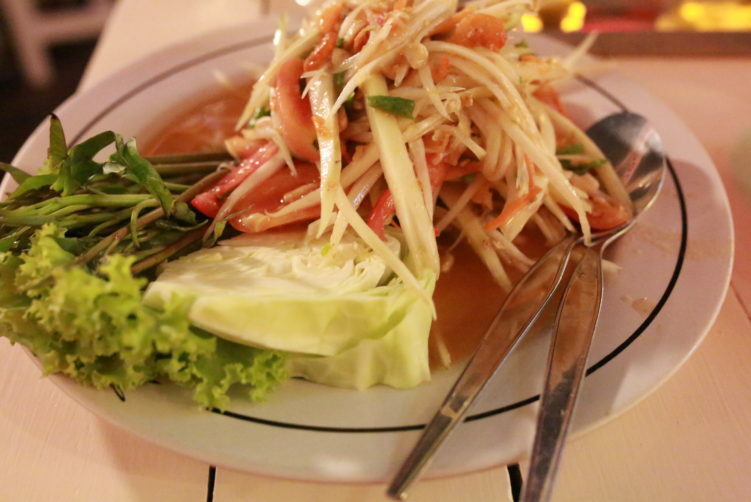 The food is classic Thai plus some western dishes, but it’s without any fingerspitzengefühlthe. The quality is just ordinary minus, and I was really in doubt if I should spend time writing about it or not. Well I did, as it is a rather popular spot for paying a lot more than you get. But first, if a nice view that comes with a breeze in a nice ambience on the riverside is your goal for the evening, you will have an enjoyable experience. Sipping a cocktail or chilling off with a Singha. Also, the staff is friendly and attentive. The cliental on my visit was about 70 % Thais, so I expected some quality food to be served. Most of them seemed to be on a business wallet or they had a family evening out. Also some younger Thai guys taking their girlfriend out for a nice romantic evening. And honestly, if the food isn’t the your purpose and it’s ok to just fill the tank to get going, it’s absolutely a good location. The menu is mostly seafood based. I ordered sea bass steamed in soy sauce with some herbs on top. They keep their fish alive in small thanks until you’re order is set. Normally a very good sign, but I have to say I did some eye lifting when I was served – the fish came boiling in soy sauce, and I mean boiling. Steaming? I didn’t see anything to that. The result was of course dried out and mushy white meat. The sauce on the other hand was decent. But to charge med B380 for a plate that even a hungry cat would shy away from? 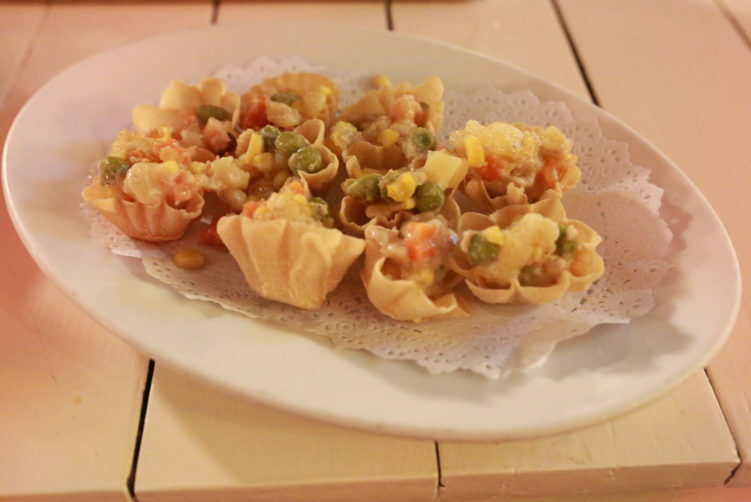 I also ordered the Gold Cups as an appetizer, together with som tam thai (papaya salad) and fried rice. I can immediately kill any roumers about gold in those cups. On he other hand, I spotted some overcooked green pies, corns etc. in a dough that was far to thick and tasteless. The som tam thai was decent and medium spiced. The fried rice was cold when arriving at the table. I presume they just make a huge badge when making it. That’s of course the recipe for bad fried rice. It all came in at B945, including 2 bottles of Singha that was the highlight of the meal. There’s tons of vendors selling better food in Bangkok. 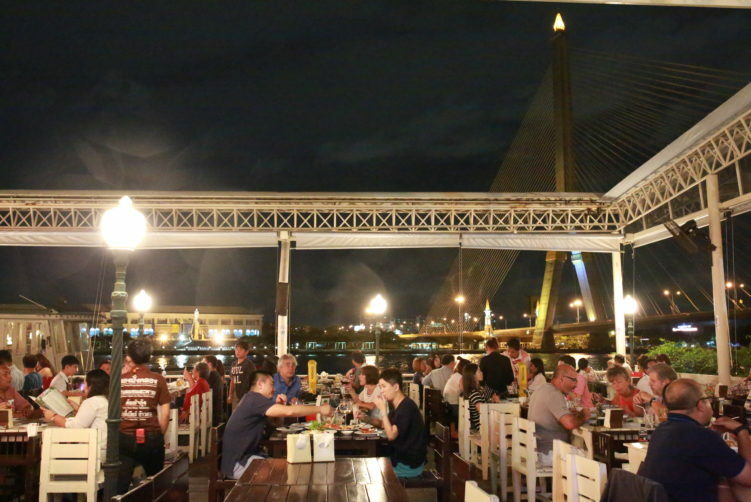 The ambience with a nice breeze and a view towards Rama VIII bridge is the value. But despite mediocre food, it’s plenty of people coming to Khin Lom Chom Sa Phan every evening. It’s a rather big venue with about 200+ seatings on the terrace. Wooden furniture’s all over. If you want to eat, my bet would be to go for simple stir-fried dishes or maybe a curry. There is no phone reservation after 6 pm. If you consider going here I would strongly advice the evening, and make sure you get a table at the waterfront (specify thoroughly when reserving). If it starts to rain they have a foldable roof. The ambience comes with the classic live band open air terrace band playing Thai songs. You don’t hear to much of them, which I presume is the purpose. It’s there to fill in the pauses of any conversation. Would I go back? Absolutely not. There’s plenty of places with a view along the riverside and with a lot better food. You can use my Bangkok Food Map to check if there is anything good close to where you are now. https://sheisfiercehq.com/shop/ buy now Food: Extensive menu, mostly seafood based, but also some curries etc. https://globaldevincubator.org/privacy-and-legal/ buy now Price: You pay for the view, so make sure you get one. Address: 11/6 Samsen Road, Soi 3. How to get there: If you live in the Phra Athit area. You can easily walk there, just follow Samsen road until you get to Soi3, turn left and it’s at the end of the soi (around 3-400 meters into the soi). You can’t miss it. Tuk Tuk take 5 minutes from Phra Athit road. Otherwise, taxi is your best option.